Raaga.com: Love to taste R.D. Burman’s favorite Dish? Visit Asha Bhosle’s new restaurant at Manchester in U.K.
Love to taste R.D. Burman’s favorite Dish? 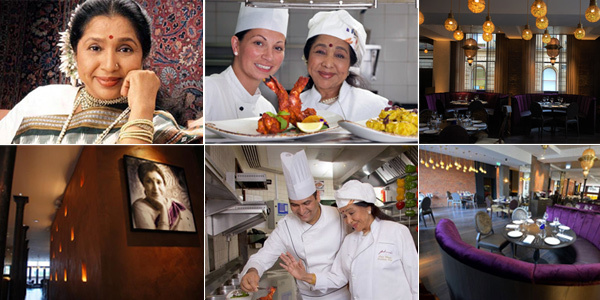 Visit Asha Bhosle’s new restaurant at Manchester in U.K.
Music monarch R.D.Burman and singing legend Asha Bhosle may be famous for their mind-blowing music but few are aware that both had a penchant for food. While Burman is no more, his wife Asha Bhosle continues their passion for food. Her signature restaurant Asha’s - the 10th hotel will soon be inaugurated at Manchester in U.K. Asha Bhosle, 82, will be among the guests at the VIP launch party scheduled on Thursday and the restaurant will officially open its doors on Friday. It may be noted Asha Bhosle started hotel business in the 1990’s with her first restaurant at Wafi City, Dubai and since then she has opened many hotels in Abu Dhabi, Kuwait, Qatar, Bharain, Egypt etc and what’s amazing is that her acclaimed chain of hotels have featured in the Michelin Guide more than eight times. Located in the heritage mid-nineteenth century Grade II listed building on the corner of Peter Street and Mount Street (opposite the Midland) in Manchester, the hotel has been into renovation for the past one year and has spent around £2m on its revamp. The restaurant displays portraits of Bhosle and her family, along with beaded fringing inspired by her stage costumes and Asha Bhosle’s fondness for jewellery. The hotel is generously spacious spread across two floors and over 6000 sq ft; Upper ground floor includes a 100-cover restaurant while the lower ground floor will host a cocktail bar for 70 and private dining. Susan Potter, International Group Director of Asha's informed the menu is traditional Indian cuisine with many of the dishes been named as a tribute to the singer’s career and relatives. Apart from special curries like ‘bharwan tandoori aloo’, ‘tandoori jhenga’ and ‘murg masala’, the menu includes ‘Hare baingnan ka bharta’ (one of Bhosle’s mother’s favorite dishes). The Manchester branch is her second hotel in the UK, after Birmingham.